In modern times, stress has become part of almost anyone’s life. With increased demands of being consistently active in some way, whether physically or by making plans even in our resting periods, it’s no wonder our health tends to suffer. In simple words, stress is the body’s way of responding to demands. In moderate amounts it can be a good thing. When it comes to challenging activities such as exams, work tasks or any other important event, your body benefits from increased energy, due to the chemicals released into the blood. This improves your ability to focus and perform under pressure. However, stress as a predominant state of your body can be highly detrimental. Stressful states should be balanced with moments of relaxation, where your body can regain the energy it will need to perform in crucial moments. There are numerous ways that people use to destress. Like in most health-related aspects, your diet plays a crucial part in ensuring the body is functioning at optimal parameters. If there’s one thing you can expect when talking about healthy foods, it’s that they are all natural. Highly processed foods, those that are high in fat and sugars, are one of the most common factors for the body’s inability to properly relieve from stress. As for the recommended foods, green leafy vegetables are considered one of the best choices. Pistachios and spinach, in particular, are well-known for their high content of magnesium, which is commonly recommended by doctors against stress. The fiber content in these foods also ensures increased levels of energy and helps digestion function properly, which is another area that stress can typically affect. Vegetables, in general, are a great source of nutrients. Fish is also recommended against stress-related problems due to them being the best source of omega-3 fats – these help ensure proper heart and blood vessel health by reducing the level of cholesterol in the blood. Some examples of the richest fish in healthy fats are mackerel, trout, herring, tuna and salmon. Omega-3 can be found in nuts and seeds, as well, although in lower quantities. Fruits are another handy tool towards a more relaxed body. They are an excellent source of vitamins, antioxidants and other health-promoting compounds. Avocados, berries and citrus fruits are widely recommended in this case. 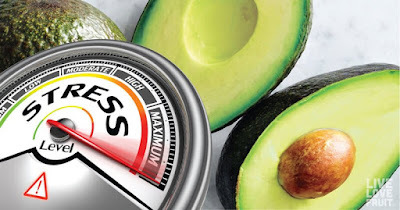 The avocado is known to help block fat absorption, due to containing glutathione. This fruit also contributes to the brain and skin health. Berries and citrus fruits are excellent sources of energy that help improve your overall health through immune system boosts. Carbohydrates are also a good way of reducing stress. Grain foods lead to better moods, due to their ability of increasing serotonin levels in your organims. They are also a good source of magnesium which, as mentioned previously, helps calm your body and reduces hypertension risks. Good sources of carbohydrates are sweet potatoes, pasta, oatmeals, turkey meat and rice. Stress can also be reduced through rest, exercise and pleasant activities outside of work. But it is the diet where it should all start, as a body cannot become healthy unless your food is so.